Ensuring that your motor is tested regularly will reduce the chance of it failing. If you have motors critical to the operations of your business, you should be looking to ensure it is tested more frequently. By proactively testing your motors correctly it can identify faults and potential issues, which will in turn reduce downtime. 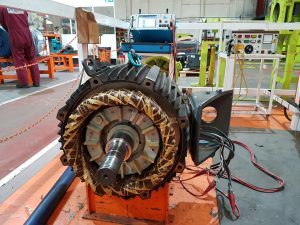 Team Rewinds are one of few in the North-East region to offer non-destructive electric motor testing, using a portable Advanced Winding Analyzer Baker Tester. The Baker Tester can be used on or off a customer’s site and integrates a wide range of electrical tests including surge, polarization index, DC HiPot, megohm and winding resistance. Baker testing is ideal for motors that are difficult to remove, have been in storage, or are critical to operations. Alternative motor testing is available; the most common type being a Megger test. A Megger test makes use of an insulation tester resistance meter that will help to verify the condition of electrical insulation, whilst the Baker Tester is more in-depth and can identify issues that may affect your motors, that a Megger Test wouldn’t. It is the difference between getting an x-ray or an MRI scan. Team Rewinds have helped many customers over the years by offering this service. Including a customer who brought a 75KW motor to their factory for baring change and overhaul. The company automatically baker test any motor over 11KW to ensure there are no other hidden issues with the motor. When this motor was tested it identified that it had more issues than originally thought and it needed a complete motor rewind. This prevented the motor being fitted back into the customers machine and breaking down again in the near future. This saved the customer time and money in the long run.